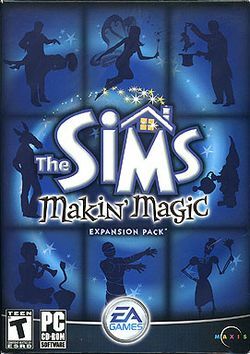 The Sims Makin' Magic is the latest expansion pack to The Sims that allows your sims to create spells and charms. Magic Town is also introduced. For more about Magic Town, please see that section. Along with being able to create spells and charms, many new people and items are introduced in the game. Just like the Somebodys from Superstar, there are the Stranges for Makin' Magic. They include family members Jeb, Phermas, Eon, Thodos, Thog, Calos, Landoloss, Hope, Selena, and Divine to name a few. Makin' Magic also includes the ability to make rollercoasters for a sim's enjoyment, a skeleton house maid, a performance stage, a spell and charm maker, and a magic beanstalk. This new Sims expansion pack revolves around the making and use of spells and charms.